Buerkle Blog Which SUV Fits You for the New Year? Which SUV Fits You for the New Year? If your New Year’s Resolution was to find the perfect family vehicle, you’re in luck! Honda’s SUV lineup is new and improved for 2019. All of these great SUVs are available in either front-wheel drive or all-wheel drive, so that you can pick how much grip and traction control you need in your life. You can compare the Honda CR-V, HR-V, and Pilot SUVs right here! The 2019 Honda HR-V offers the practicality and versatility of an SUV in a compact package, with lots of personality and customizable accessories. This little crossover has lots of appeal to anyone with an active lifestyle, with fresh styling and sporty trims. The HR-V EX and above trims feature Walkaway Auto Lock doors, Smart Entry, and Pushbutton Start. The EX trim also comes with a moonroof, heated front seats, and rear privacy glass. The HR-V’s interior also packs lots of versatile space into its cabin. It offers voluminous passenger and cargo space inside, including some nice storage features like door-pocket storage bins, cargo area tie-down anchors, and a revised stay-spring mechanism that makes it easier to access the cargo area. The HR-V comes with Honda’s multi-position 2nd Row Magic Seats, which are easily reconfigured into the cargo and passenger space you need. It’s available in five trims, and now also gets the safety benefits of Honda’s excellent Honda Sensing safety technology suite! The 2019 Honda CR-V comes with just about everything you need for daily driving as well as weekend adventure. From its distinctive style to its advanced technology, the CR-V stands out from the crowd. This compact SUV sits in the middle of the Honda SUV lineup, with two rows of seating and plenty of room left over for cargo. It also comes with tons of standard and available features that make it super versatile, like the available Hands-Free Power Tailgate, 7-inch Display Audio touchscreen, Apple CarPlay and Android Auto, full LED headlights, a standard multi-angle rearview camera, and much more. 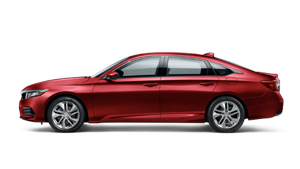 All but the LX trim now also have standard Honda Sensing, a suite of advanced safety and driver assist features. It comes with a 190-horsepower engine and offers a towing capacity of up to 1500 pounds if you need it! This long-time family favorite offers seating for up to eight, with a comfortable cabin and tons of cargo space. The 2019 Honda Pilot offers family-oriented features like CabinTalk, which makes it easy to communicate from the front seats to the rear with the available in-car PA system. There are plenty of outlets and points to charge passenger’s devices, and even an available wireless phone charger that provides a perfect spot to rest and charge your phone! Entertainment features inside the cabin also include the available eight-inch Display Audio Touch Screen infotainment center. All of your passengers can stay comfortable with the available tri-zone automatic climate control, which lets each row individually adjust their own temperature. There’s also a Hands-Free Power Tailgate, which makes it easy to load up after a grocery run or at the start of an adventure. The Pilot’s standard engine runs on 280 horsepower, and it offers responsive handling and excellent traction to keep you safe and on your way. If you’d like to come try out these awesome SUVs for yourself, stop by and visit us here in St. Paul, MN! We can help you find the perfect car, truck, or SUV that fits all of your needs. Don’t hesitate to ask questions! Our friendly, knowledgeable sales team is ready to answer all your questions and make sure you find the perfect Honda for your life. Plus, if you find your new Honda here with us, you’ll be eligible to get the perks of our great Buerkle Rewards program. You’ll get benefits like two free oil changes, two free tire rotations, 5% back on parts and services, and more! We’re located near Minneapolis, Inver Grove, and Blaine, so stop by and see us soon! *MSRP excluding tax, license, registration, $1,045.00 destination charge and options. Dealers set own prices. **MSRP excluding tax, license, registration, $1,045.00 destination charge and options. Dealers set own prices. ***MSRP excluding tax, license, registration, $1,045.00 destination charge and options. Dealers set own prices.